Worcester, Mass. – A professor at Worcester Polytechnic Institute (WPI) is exploring aging on the molecular level, examining how the lipids found in our bodies, particularly those in our cell membranes, change as we age, and how those changes may affect bone and muscle strength, brain health, and our propensity for age-related diseases, including Alzheimer's disease. With a two-year, nearly $421,000 grant from the National Institutes of Health, Carissa Perez Olsen hopes to gain a better understanding of the role lipids play in longevity and long-term health. Olsen, the Leonard P. Kinnicutt Assistant Professor of Chemistry and Biochemistry, says the key to healthy aging could lie with our lipid production and how that production changes over time, affecting the health of cell membranes. A better understanding of those processes could lead to the development of new medications or lipid replacement to alleviate or eliminate some diseases, helping people stay stronger and more mobile and have better brain health as they age into their 90s. "No one wants to get old and spend years in a decrepit state," said Olsen. "This research asks the fundamental question: why are we so good at being alive and healthy for a certain period of time, and then things just fall apart as we get older? What are the processes that do such a great job of keeping us in a healthy state, and why do they go away?" In her research, she is interested not only in how lipids affect our lifespan, but how they influence our "healthspan," which is the number of years that we remain healthy. She wants to know whether it is possible for animals, including humans, to live longer and stay healthier longer by stabilizing the production of the lipids that make up the structure of cell membranes; the quality of those membranes affects the health of the cells they enclose. "We know cell damage contributes to aging but we don't know the exact details of what is going wrong," said Olsen. "If we can understand how the process of lipid production and healthy cell growth works normally, we can understand how it goes awry." Phospholipids are a particular type of lipid that make up much of the structure of cell membranes. These membranes form a barrier that protects cells, keeps them in their proper shape, and helps them perform their normal functions, like producing energy, absorbing nutrients, and warding off disease. Young, healthy animals have a specific combination of phospholipids in their cell membranes, which are continually replenished. As animals age, the combination changes and the rate of replenishment slows. Olsen wants to know why these changes occur, and how they are connected to the degradation that occurs in the cell membranes. She also wants to understand how those changes impair the cells' normal functioning, leaving them prone to cell death or diseases. Olsen conducts her research using the nematode Caenorhabditis elegans (C. elegans), which has a short lifespan, enabling her to conduct numerous observations and experiments in a relatively short period of time. Because the biological structures and processes she is studying are common in all animals, her work with C. elegans has implications for human health and aging. While Olsen doesn't think age-related changes in the production of phospholipids or the resulting degradation of the cell membranes lead to cancer, she did note that certain lipids found in cell membranes can impact cancer treatment options, such as drug delivery methods. She is exploring whether scientists can create lipid replacement treatments to alter the lipid composition in membranes to improve how well cells absorb and use medications. In addition, since cancer itself can cause changes in cell membranes, doctors might be able to stop its spread if they could prevent those membrane changes by adding certain lipids into a patient's drug regime. 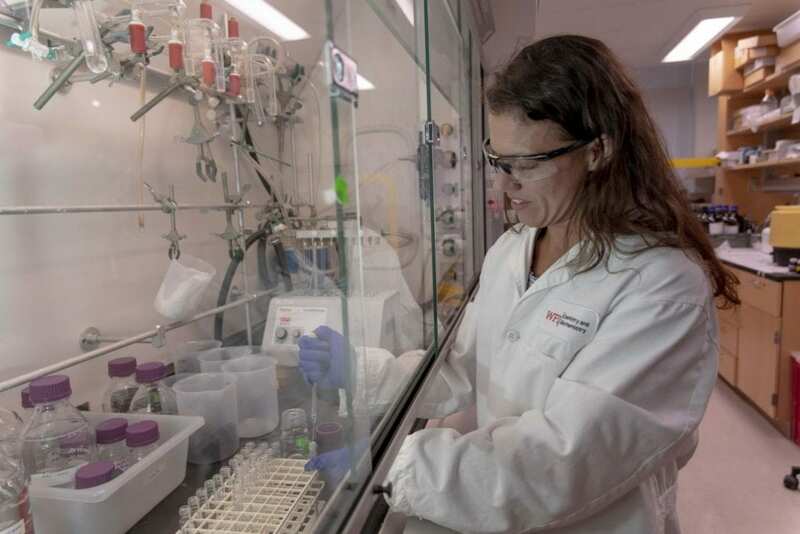 For the past three years, Olsen also has been researching the connection between lipids, cell membranes, and Alzheimer's, research she began at the Fred Hutchinson Cancer Research Center in Seattle. In that work, she found that fewer types of specific lipids are produced in people with Alzheimer's, suggesting possible targets for future lipid replacement therapies.